Jews still threatened with annihilation, Netanyahu tells Vilnius congregation, but Jews 'are no longer helpless'. Israeli Prime Minister Binyamin Netanyahu told leaders of the Lithuanian Jewish community that many are still attempting to destroy the Jewish people. Netanyahu and his wife, Sara on Sunday visited the Choral Synagogue in Vilnius, the only synagogue in the city that survived World War II. The Netanyahus visited the Vilna Ghetto on Saturday. 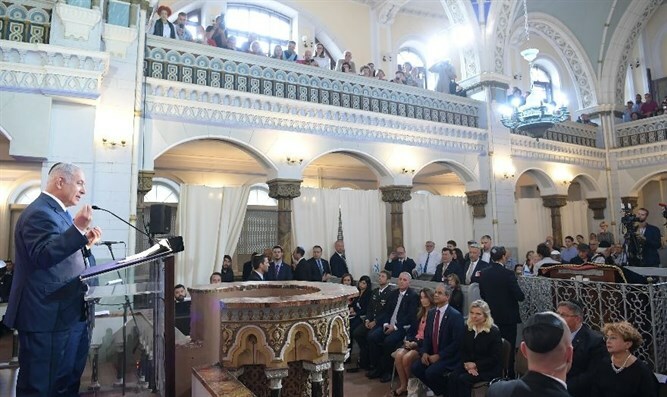 “Yesterday we saw the glory of Jewish Vilna that was lost and in this visit we see an expression of what has been retrieved – the rise of the reborn Jewish state of Israel. What a distance we have travelled in 75 years from the death pits of Ponar to a rising power in the world,” he said. “I want to thank you Linas for standing up for Israel and the truth in European forums, for telling your colleagues the service that Israel performs in saving so many European lives by our resourceful and brave intelligence people. We have saved so many European lives in so many countries. Israel in many ways is the defender of Europe and it’s time that Europe understood this,” he said. The prime minister is in Lithuania to take part in the Baltic States Summit, the first time that a prime minister of Israel has visited Lithuania and has been invited to the summit.